Previously here on Hello Materials Blog we presented Master Graduate Jonas Edvard Nielsen and his final project at the Royal Academy of Art – School of design in Denmark in 2013: MYX material – Creating food and design from waste using oyster mushroom. Graduating the same year and presenting a likewise amazing and super interesting final project is Nikolaj Steenfatt and his project “IMPASTO”. I was lucky to meet Nikolaj and get a good insight in his immense work with IMPASTO at the Design School last year where his work was exhibited. Here’s the story behind Nikolajs project. IMPASTO is a self-invented biodegradable natural fibre composite made of leftovers from wood-, coffee- and skin production. 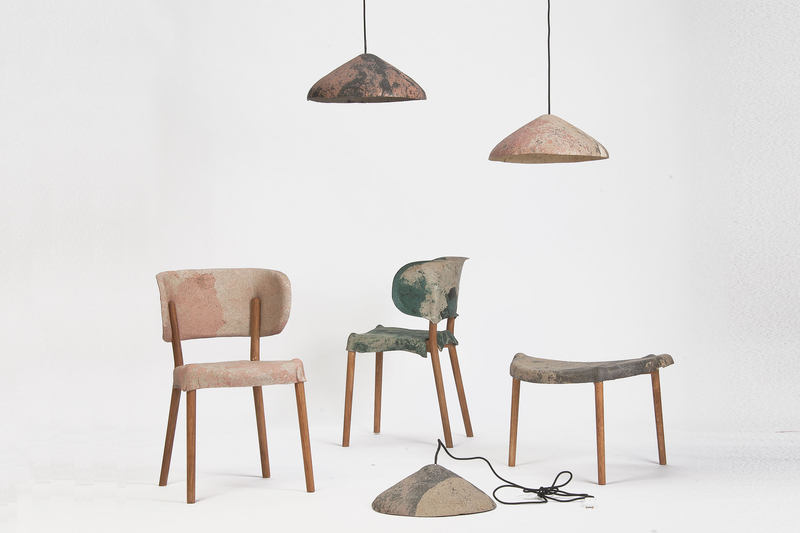 The raw materials are mixed with pigment into a dough, pressed, rolled and folded into flat sheets, and then vacuum-formed to create the range of chairs, tables and pendants. The project is based on Nikolaj’s sustainable materials research. This lead to experiments with different natural fibres and binders, with the aim of creating a new material that is biodegradable, easy to work with and simple to understand. 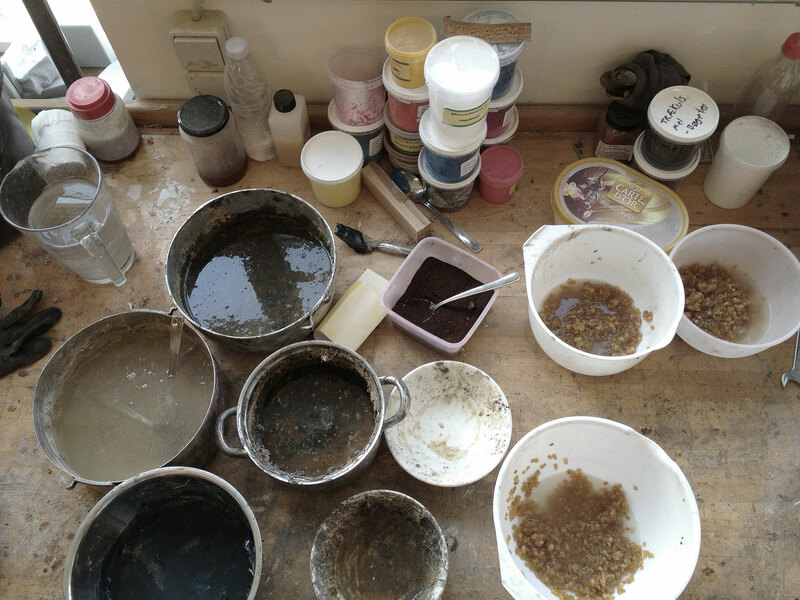 The development of the production process is driven by an idea of creating a process that is adaptable to the industry, but has a unique output as if it was handmade. The process has so far been used in a series of products, where the meeting of oak and fibre composite has become a central detail in the design. The “handmade – high tech” process makes every piece in the collection unique. As mentioned the Project started as a graduation project at The Royal Academy of Art – School of Design in Denmark in 2013, and is still under further development. The composites are made out of used coffee grounds, sawdust and animal glues. – Materials that are all waste products from other industries. Composite materials made of natural fibres are more and more used in the furniture industry. The natural fibres contain strength, and are a more bio friendly choice compared to synthetic fibres. Most of the natural fibre composites on the market are using a synthetic binder (matrix) that makes the material less sustainable. 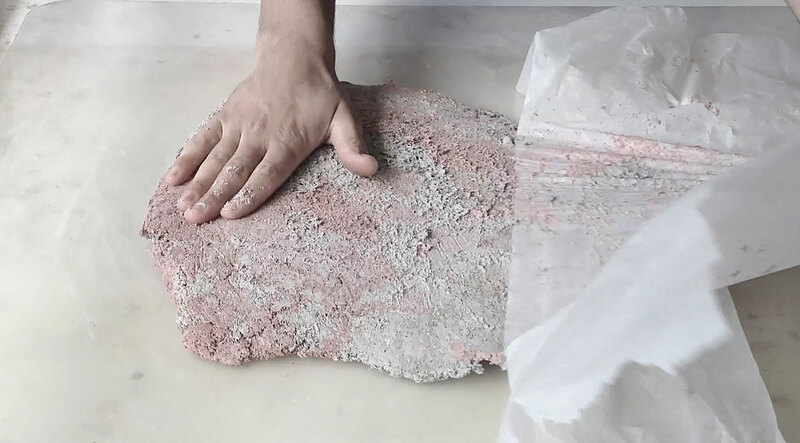 IMPASTO uses animal glue as binder, which makes the material 100% biodegradable. The animal glue is made of untanned hides. 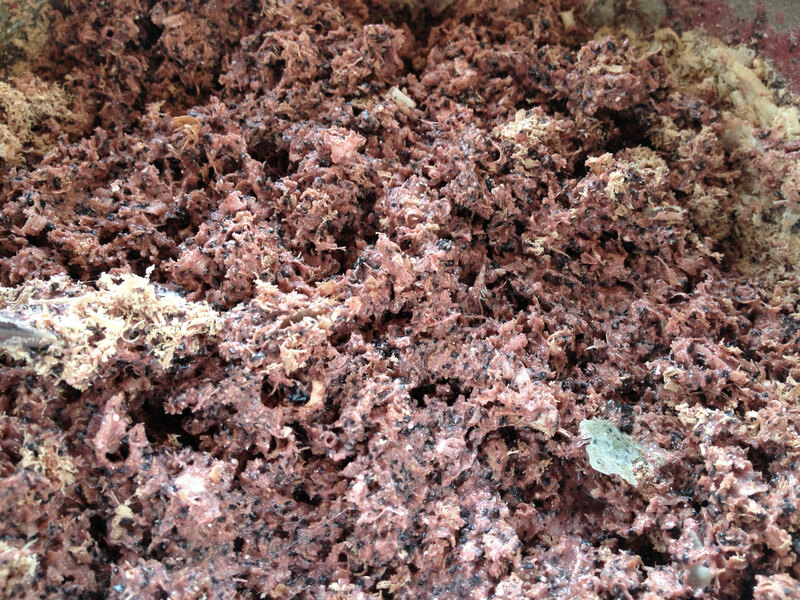 It can be made of small hide pieces and leftovers from the skin production. The wood industry incurs 50% to 80% of timber wastage in the process of making wood from planks to products, in a normal manufacturing. By using sawdust as fibres in the composite material, the making process turns waste into a new material. The production of the wooden construction for the chair generates enough sawdust to make the seat. We all know how much waste our own production of coffee in the daily use is generating. So just think about how much used coffee grounds we are throwing out worldwide! By adding a well-known waste product, we question people in how much waste we are generating, and make them think of what we can create with it instead of throwing it away. The final product is biodegradable and does not leave any imprint on the nature. The production process is adaptable to the furniture industry, but in a way that every piece becomes unique like if it was hand-made. When the dough in different colours is pressed together in the custom made roller, the colours create an iridescent finish that is comparable with the play of colours in marble. The result is different every time even though, you are repeating the process exactly the same way. This makes the production process interesting, because it makes it possible to turn the process into a more industrialised process with out loosing the unique expression of every piece. By using vacuum forming and a positive mould, the process is easy to do in big scale and easy to change because of the simple mould. 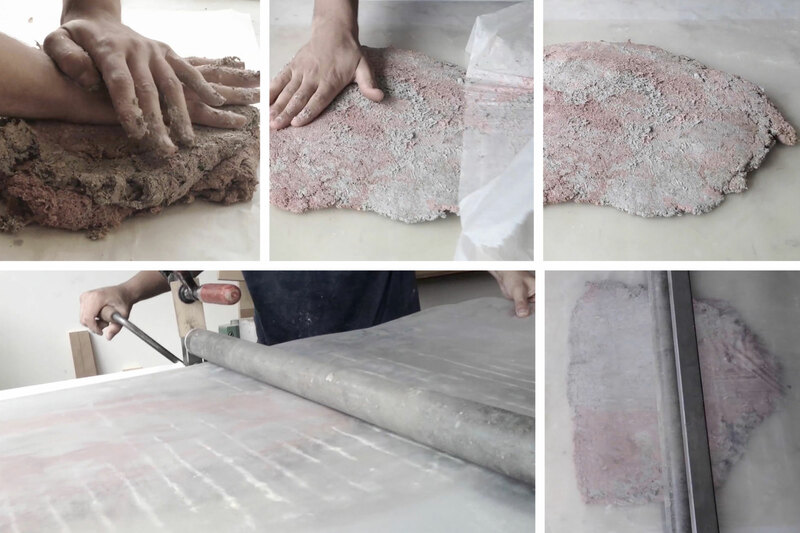 After the sheet is shaped the material is simply drying by air. Nikolaj Steenfatt is a Copenhagen based Furniture – and Product Designer, educated from the Royal Danish Academy of Fine Arts, School of Design in 2013. Born in 1987 in southern Jutland in Denmark. Started at The Danish Design School in 2007 (Royal Danish Academy of Fine Arts, School of Design). Bachelor in 2010 and Master in 2013. Read more about Nikolaj and his work here. This entry was posted in Material Innovation and tagged biocompatible materials, Biodegradable materials, Natural Fibre, raw materials, sustainability, Sustainable materials, Sustainable solutions. Bookmark the permalink. Det bliver spændende at se hvilke mekaniske og fysiske egenskaber som Nikolajs interessante materialer har. Sammen med økonomien i processen er det nok det der afgør om de har en fremtid til produktion af møbler og produkter. Please note that we are a supplier of natural jute fibres, textile waste, tires waste, PET bottle waste from Bangladesh. Kindly let us know if you are interested in our goods. Packed in Bales. Loaded per 20′ , 40′ containers. Shall appreciate, if you would kindly let us know if you have any other business opportunities for our mutual benefits. We are the plastic manufacturing company in USA. Thanks for the tips! This is great….